UNITY: Solidarity with Venezuelan revolution so important as US deploys "Fourth Fleet"
Solidarity with Venezuelan revolution so important as US deploys "Fourth Fleet"
Washington is deeply worried by the grassroots movements for social change in Latin America. The Venezuela revolution is leading a revolt against neo-liberalism and US hegemony that's igniting the whole continent. But like any imperial overlord the US is not going to simply leave. Wracked by economic problems of 1930s depression era magnitude and fearful of the growing power of its main rivals (China, Europe and Russia), US capitalism doesn't want to lose control over Latin America. It certainly doesn't want a model of open democratic socialism establishing itself permanently and inspiring wider rebellions. This is the reason Washington has re-established the "Fourth Fleet" to patrol the waters off the South American coast. This is an aggressive deployment with a clear goal - given the right circumstances and pretext - of intervening militarily against countries that don't bow to Washington. It's because the imperialist beast won't stay in its corner that international solidarity with the Venezuelan revolution and the wider Latin American uprisings are so important. A solidarity network is in the process of being established in New Zealand. VAMOS stands for Venezuela Aotearoa Movement Of Solidarity (which means “let’s go” in Spanish, the main language of Venezuela). Contact UNITYblog to get in touch with VAMOS activists in your region. Find out more about the Venezuelan revolution by reading articles included on the UNITYblog sidebar. Washington announced at the end of last month that it is resurrecting the long-ago moth-balled Fourth Fleet to reassert US power in the Caribbean and Latin America. Created at the time of World War II to combat German submarines attacking merchant shipping convoys in the South Atlantic, the Fourth Fleet was seen as no longer necessary after the Second World War and was disbanded in 1950. The Pentagon's a statement on the revival of the fleet gave a far vaguer indication of its new duties, saying it would "conduct varying missions including a range of contingency operations, counter narco-terrorism, and theater security cooperation activities." "Rear Admiral James Stevenson, commander of U.S. 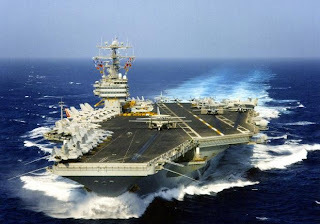 Naval Forces Southern Command, said the re-establishment of the Fourth Fleet will send a message to the entire region, not just Venezuela," AHN news reported. The "message" began to be transmitted just weeks after Venezuela, Ecuador and Colombia came into sharp conflict over a border provocation caused by the Colombian military's bombardment of an encampment of the FARC (Revolutionary Armed Forces of Colombia) guerrillas inside Ecuadorian territory. The Fourth Fleet will begin operations on the first day of July out of the Mayport US Naval Station, a nuclear facility in the state of Florida. The fleet, which will operate as part of the Pentagon's Southern Command, will be comprised of various ships, including aircraft carriers and submarines, and will operate from the Caribbean to the southern tip of South America.